You are driving the orange car and you're waiting at a red light to turn right. Which lane do you turn into. You are driving the orange car and you're waiting at a red light to turn right. Which lane do you turn into. You are in the right-hand lane, so you turn into the right-hand lane of the dual carriageway. C is an oncoming lane. Choose a lane early and choose the lane that corresponds with the destination lane that is right for you; try to avoid changing lanes near intersections, and definitely not in the intersection itself. When you are turning at an intersection the rule is to drive to the corresponding lane on the road you are turning into, unless directed differently by an arrow on the road or a sign. If you are turning from a dual carriageway into another dual carriageway from the right-hand lane then you will turn into the right-hand lane; if you're turning from the left-hand lane (if that's allowed) then you'll turn into the left-hand lane. Be wary of long vehicles when turning as they might need to cut the corner to get around when turning from the outside lane, or the front of their vehicle could enter into the left lane if they are in the right lane. Try to make a judgement as to how likely it is that the lane you are choosing will move faster. For example, if you are turning onto a motorway on-ramp and there are two entrance lanes, those lanes will ultimately end in one lane as traffic merges. Therefore, you could try to guess which lane will be faster by looking at the vehicles in the lane. 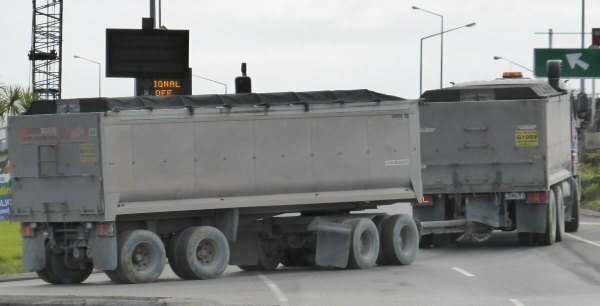 Large, articulated trucks tend to be slower if they are heavily laden - this is because they can't accelerate fast, and they can't make a sharp turn onto the motorway on-ramp at speed.